Astounding! 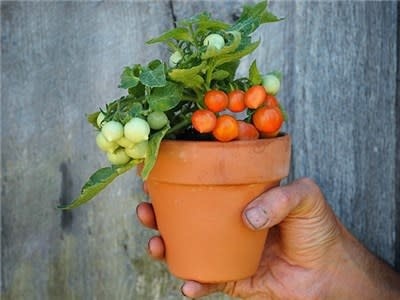 The world's shortest tomato plant, fit for a fairy garden, reaching a mere 6-8” tall! These dainty, dwarf determinate plants were developed by the University of Florida and are the ultimate potted vegetable plant. Super productive little plants are completely enveloped in bright red, tasty 1 oz fruit. The tidy, round plants covered in red orbs make an eye catching hanging basket or container plant. Ideal for urban gardening, indoor plants, patios or for the tiny house garden! The possibilities are endless with this novel dwarf tomato.